Believe me I know how confusing things seem right now. There is such a lot to do and so much information out there. This guide will help you lay the foundations for a successful blog. Learn what you should have on your blog, and exactly what you need to need to be doing as a new blogger. Of course, what you shouldn’t be doing can be just as important so I’ve covered that too. 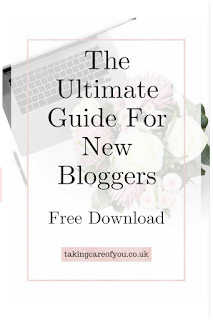 Find out what all those confusing blogging terms mean and of course a guide wouldn’t be complete without some hot tips! Now this is a long one so I’ve put together a handy PDF version for you to refer back to. Now I’m going to skip the techy stuff and assume that you have your blog set up and you are starting to add content. 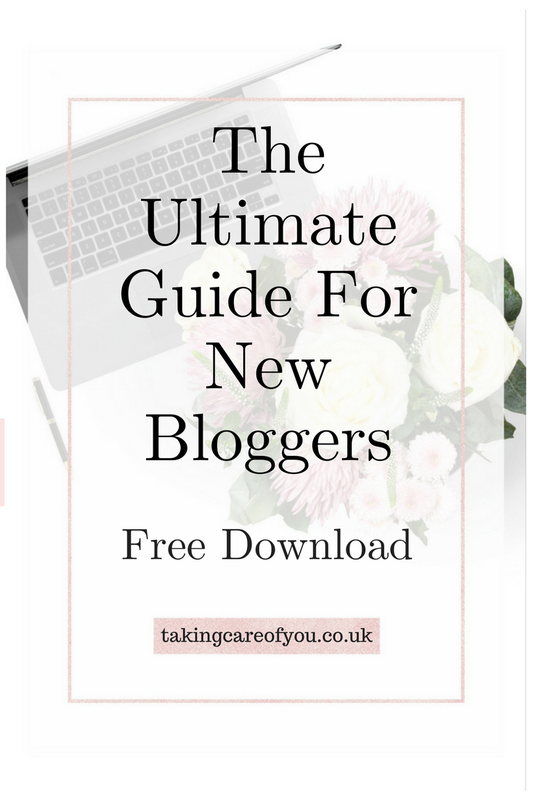 If you are yet to start your blog then check out this super useful free course. An About Me Page - This is very important and can be one of the most visited pages on your blog. There are very specific elements that you need to include on this page. A clear photo of you (not a selfie). An introduction, tell you readers a little bit about yourself but more importantly tell them how you can help them. What problems you are going to solve for them and why they should read your blog. Tell them your story. What brought you to where you are now and how you are qualified to help them. Be as honest and open, this is your chance to connect with your readers. Include an email opt in form. Add a few links to your best posts. You should also make it easy for your readers to contact you. Organised Categories - Your blog should be organised into categories and you should have a navigation menu. Your readers need to be able to get around your site easily and find exactly what they are looking for. A Commenting System - This is an invaluable way to connect with your readers. Allow them to comment on your posts and always reply. If your readers cannot comment you are losing the chance to build a rapport with them. Social Share Buttons - Install social share buttons using a plugin like Social Warfare. This gives your readers the opportunity to share your posts to social media, driving more traffic to your blog. An affiliate disclaimer should also be included on every page that contains affiliate links. Amazing Content - Your blog posts should be engaging, over 1000 words and split up into easy to read paragraphs. You should also include quality images. You posts should give your readers value, teaching them something or solving a problem they may have. - Being a blogger is a very brave thing to do. If you have built your site and hit publish on a few posts then you are my hero already. It’s incredibly hard to put yourself out there, to let strangers read your work and pass (possibly harsh) criticism. You have to promote yourself on social media, and write email to hundreds (or thousands) of people. Yes, I know I’ve made that sound terrifying and I was terrified at first, but it does get easier as time goes on. Always remember that this is not an easy thing you are doing, but don’t be scared and let it get the better of you because the satisfaction is so much greater than the fear. - Your blog isn’t actually about you. Well of course it is a little bit but mainly it’s about your audience. What do they want to read?, what problems do they have? and what value can you give them? Your readers have to care about what you are writing. Always remember that your blog has to serve them. - The number of posts you write is not as important as you think. It is always better to write 2 quality, in depth posts per week than 5 mediocre ones. It is much more important to be consistent with your blog posts. Choose a number that is realistic for you to produce high quality content and stick to that number. - It is possible to blog on a budget. There are many free tools, ebooks and courses out there as well as blog posts like this one. If you do want to buy some blogging courses you can get on that bloggers email list and wait for a sale or you can join a beta testing group for a course and get a huge discount or sometimes even receive the course for free. There are also many sites where free stock photos are available for your graphics. - You don’t need a top of the range laptop to run a successful blog. In fact a lot of your blogging tasks can be done on your phone. There are many apps available to help blog wherever you are. All of the social media platforms have apps available and there are so many apps for planning and organising your work. Trello and Wunderlist are 2 of my favourites. You can schedule pins and social media posts from your phone and make gorgeous pins and graphics as Canva and PicMonkey both have their own apps. When you first start blogging it can almost seem like another language. To avoid overwhelm, here is is list of terms every new blogger needs to know. Affiliate Marketing - A program where you receive commission for recommending a product on your blog. Above the fold - The part of the screen that can be seen before you start scrolling. Bounce Rate - The percentage of people who leave your site after viewing just one page. Backlink - This is a link to your blog from another website. Content Upgrade - More detailed content that your readers can download in exchange for their email address. Contributer - This is anyone who adds content to your blog. Cookies - These are pieces of information that are stored about user preferences. Domain Name - This is the main part of your website url. My domain name is takingcareofyou.co.uk. Evergreen content - This is content that is appropriate all year round. Posts about specific holidays are not evergreen. Email Service Provider - A service that allows you to build an email list. Examples are MailChimp, Convertkit, and Mailerlite. Featured Image - The main image of a blog post. This is usually used as a preview on social media. Guest Post - A post featured on your site that is written by another blogger. Hyperlink - A piece of text or an image that links to another website. Homepage - The main page of your blog. Keyword - A word or phrase that is commonly typed into search engines. Keyword Research - This is the process of looking for relevant keywords to include in your blog post. Long-tail Keyword - A keyword that is made up of 4 or more words. Meta Description - A summary of your blog post. This will be seen in search results. Media Kit - This is a document containing information about your blog, it’s following, and your social media accounts. This is used when applying to work with brands. Organic Traffic - The traffic that comes to your blog from a search engine. Permalink - A permanent link to your blog post. Plugin - This is software that you add to your blog to enhance it. There are a lot of plugins available. Redirect - When a page is instructed to send visitors to another URL. SEO - Search Engine Optimisation. The process of making your post rank on search engines. This is done by adding keywords, and internal and external links. Stock Photo - This is an image that has been licensed for use. They can be purchased or downloaded for free. Theme - This is a template for the style and layout of your blog. It allows you to customise your blog. URL - Unique Resource Locator. This is your blogs web address. Usability - This describes how easy it is for your readers to navigate your blog. VA - Virtual Assistant - A person you can hire to help with tasks on your blog. This usually involves dealing with social media accounts. - You need to set up social media accounts for your blog. Set up Facebook, Twitter and Instagram accounts using your blogs name. Try to use the same images on all of your profiles. I do recommend only concentrating on 1 or 2 of them at first. - Set up a Pinterest account. This is one of the best things you can do for your blog. When used correctly Pinterest can drive huge amounts of traffic to your blog. - You should be promoting your posts on your social media accounts and in Facebook groups. - Make sure your blog is secure and that you back up your files regularly. - You should be reaching out to your fellow bloggers. Join Facebook groups and comment on blogs in your niche on a regular basis. There is an amazing community of bloggers out there who will welcome you with open arms. - Join some email lists. I have picked up some extremely valuable tips from emails. There is always helpful free downloadable content to help you. - Install google analytics. This gives you incredibly helpful information, especially for Pinterest. - Including keywords in your posts, meta descriptions and image alt tags. - Regularly check the links on your blog to make sure they are not broken. You also need to check that the affiliate products you link to are still available. - Create a content calendar. There is so much to do when you are growing your blog, it is essential that you are organised. If you know in advance what you are going to be writing about then you will be able to research your post ahead of time. - Building an email list. I made the mistake of waiting too long to do this. You should be collecting emails and sending out newsletters from day 1. Then as your blog grows, your list grows with it. - Create a freebie as an opt in incentive for your email list. This can be a checklist, a cheat sheet, a worksheet or access to a resource library. Your free content should provide value to your readers and solve a problem for them. - Read and learn as much as you can. The most important thing I have learned as a blogger is that I will never be done learning. Read articles, emails, social media posts, and invest in courses if you can. There are many affordable courses out there, if you are blogging on a budget. - Be patient, don’t expect your blog to explode overnight. If you put the time and work in, it will steadily grow. It normal for things to go slow at first. Don’t give up. - Make a plan, I’ve just given you an awful lot to do and you can’t do them all at once. Take things one step at a time to avoid overwhelm. - Choosing the wrong theme. Don’t choose a theme for your blog based on looks alone. It has to function well and do exactly what you want it to. It needs to be easy for your readers to navigate. Of course you want your blog to be pretty but shop around first. Bluchic have some gorgeous and functional WordPress themes. - Choosing the wrong niche. Just because you have heard a particular niche makes a lot of money or is extremely popular on Pinterest does not mean it is the right niche for you. You have to be passionate about what you blog about. How can you produce quality content when you don’t really care about what your writing about. - Not spending enough time promoting your blog. Of course it’s important to create lots of quality content. But there is no point if nobody is actually seeing it. You should be spending a huge chunk of your time promoting your posts. Get on social media, choose the platforms that are right for your blog, the ones where your readers hang out and promote as hard as you can. Without being spammy of course. - Not knowing who your ideal reader is. It is important that your content is targeted towards the right people. You need to know your audience, what they are interested in and what their problems. You can find out how to do this in this post. When you have gone through this process, you will find that your writing and post engagement will improve. - Focusing too much on traffic in the beginning. I am very guilty of this one. I would be checking my stats every 5 minutes and it wasn’t helpful. Most bloggers have pretty low traffic at first, it takes time to build up. Focusing on the low traffic will only get you down and you may lose motivation to keep going. Just keep in mind that it’s going to improve and focus on producing great content and lots of promotion. - Thinking that blogging is an easy way to make money. Believe me, it’s hard work. Yes you may be able to make a passive income from your blog but there is an awful lot of work that has to be put in before you get to that. You can’t make money with nobody reading your posts and no email subscribers. - Comparing yourself to other bloggers. This really isn’t helpful to you or your blog. Highly successful bloggers are not new, they have been doing this for a long time. Success doesn’t happen overnight, it takes a lot of hard work. Focus on your own progress, celebrate your wins. No matter how small they are. - Treating your blog like a hobby and not a business. Now if your blog is a hobby then that’s completely fine. But if you want to make money from your blog then you have to have that mindset right from the beginning. Treat your blog like a job, work hard and consistently. No random days off, you wouldn’t just not turn up to work so don’t do it with your blog. - Waiting too long before monetizing your blog. You need to do this as soon as possible. There are many affiliate programs that will allow new bloggers and if your posts are targeted you can still make money with low page views. Don’t wait until you have so many posts it takes forever to go back and add affiliate links to them. - Suffering from shiny object syndrome. You don’t need to be in every affiliate program available to you. Choose a few that are relevant to your blog that you can concentrate on. You also don’t need all the blogging courses that are on sale. We all want to learn but you can only work through 1 course at a time and they can get terribly expensive. - Don’t waste time aiming for perfection. Your blog does not have to be perfect. We are all human and perfection is just not attainable. - Give guest posting a try. It’s a great way to get your work seen by a lot of people and also gets you backlinks to your blog. - Try to be as relatable as possible in your blog posts. Readers want to get to know you. Put as much of your personality as you can in your posts while also giving your audience value. - Don’t ever think that you know all there is to know about blogging. Nobody does, we are never done learning. Always seek to educate yourself when you can. - Visit successful blogs in your niche, see what’s working for them. Use this information as inspiration for your blog. - Don’t concentrate on everything at once. Choose one social media platform that you want to master and one area of blogging. I would always recommend focusing on traffic first. Spreading yourself to thinly will just lead to overwhelm. - Launch your blog with at least 10 posts already written. This allows you the time to promote those posts properly. If you launch with only 1 or 2 posts then you can’t promote them effectively and write another 8 or so posts. Once you have spent time promoting your 10 posts you can then move to whatever content schedule you are planning to follow. - Write down all of your ideas. Ideas for your blog will come to you at all times of the day. Try to right them down straightaway, even if it’s just a quick note on your phone. You will have such a lot in your head that chances are the idea will pop right out again if you don’t make a note of it fast. - Keep a regular check on google analytic and identify your top performing posts. Finding out what your audience likes to read means you can produce similar content. - I have found that my longer posts do much better. Try to aim for more than 1000 words, it’s better to write a few longer posts than lots of short ones. - You absolutely must get on Pinterest. Open a free business account, you definitely won’t regret it. Pinterest is the number 1 source of traffic to my blog, it may take a bit of work but it’s well worth the effort. Read it through to check it all makes sense and flows well. Check you have good SEO on your post. Check that your images are of good quality and that they are optimised. Check that you have internal links to relevant posts. Make sure your meta description is filled in and is keyword rich. - Don’t multi-task, it never works. You just end up starting a lot of things and never finishing. You need to prioritise your tasks and do one thing at a time,. You will be much more productive this way. - Hold yourself accountable. You mustn’t lose focus. Give yourself deadlines and stick to them. A good way of doing this is having a blogging buddy. Someone to check on you and your progress. If you have to report back to someone, you are much more likely to get things done. - Remember that this is your blog, only you can make decisions. Read and learn as much as you can, but draw inspiration from this. If you follow every piece of advice on how your blog should look and what you should be writing you will lose the “you” in your blog. And that’s the most important thing about it. So there you go, it’s a lot of information to digest in one go so don’t forget to download your PDF copy. Above all, have fun with your blog. Don’t take on too much at once and always aim for progress not perfection.